Chicago Cubs starting pitcher Ryan Dempster picked a bad time to have one of his worst outings at Wrigley Field. Dempster struggled with his command all night and it caught up with him in the top of the fifth inning. 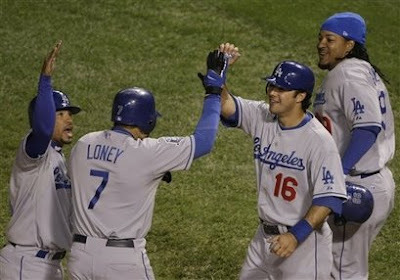 After loading the bases with Dodgers, Dempster surrendered a grand slam to Dodgers first baseman James Loney on a 1-2 pitch with two outs which turned a 2-0 Cubs lead into a 4-2 deficit. The homer came one pitch after Dempster came "this" close to striking out Loney, who fouled off the pitch to stay alive in the at bat. The boisterous crowd that felt as if it were on the brink of escaping another jam was silenced when the next pitch Dempster threw found the seats in left-center field. After that, it was almost as if the air was let out of the balloon. The Cubs were patient against Game 1 winner Derek Lowe, but were unable to string together enough hits to create or sustain a rally. As for my fellow Cubs fans, after Mark DeRosa's two-run homer in the bottom of the second inning, they were quiet, for the most part. When they weren't quiet, they said things that I'm not sure I'm allowed to post on this site. Cubs fans were critical of star left fielder Alfonso Soriano, and rightfully so. Soriano struggled mightily in last year's playoff series against the Arizona Diamondbacks, and those struggles continued in tonight's game as the slugger went 0-for-5 on the evening. Right fielder Kosuke Fukudome, the team's $48 million offseason pick-up, put together some quality at-bats in the No. 2 spot, but went 0-for-4. Don't expect K-Fuk to hit second in Thursday's Game 2. In fact, I wouldn't be surprised if manager Lou Piniella opted to use DeRosa in right field and Mike Fontenot at second base, despite Fukudome's defensive prowess. In the end, a frustrated fan base goes home down 0-1 in the best of five series, but will come back with "ace" Carlos Zambrano to square off against Chad Billingsley. Zambrano, who threw a no-hitter in September, struggled in his next two outings. The Cubs can't afford to head to L.A. down 0-2. The weight - and wait - is on Zambrano's right arm. Because remember kids: momentum is only good as your next day's starting pitcher. Good night, from the North Side of Chicago. Cubs fans, keep your head up. Rome wasn't built in a day. Neither was this ball club. Win 11 of the next 19 and we'll forget that this even happened. Let's go out and get 'em tomorrow.